Welcome Friends & Family of Alpha Sigma Alpha! 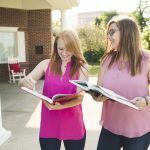 You are probably wondering what your daughter can expect to experience as a new member – as a woman of Poise and Purpose – with Alpha Sigma Alpha. We offer her the opportunity to aspire to her full potential and to create impact in the lives of individuals and the world around her. We build her up as she grows confident in who she is and who she wants to become. We help her achieve her life goals and to equip others to do the same. She is your world and we understand that you want what is best – and we want the same for her. We take great pride in fostering healthy relationships with our campus partners. With the growth and development of our collegians as the focus, our headquarters staff, advisors and volunteers work along with campus administrators to provide a positive experience for our members.